Dickinstein: Emily Dickinson – Mad Scientist coming in October! It all started on June 22, 2012, the release date of the movie Abraham Lincoln: Vampire Hunter. I had listened to the book on my iPod the year before and enjoyed it enough to want to see the movie. On the way to work that day, I began to wonder about what might have inspired Seth Grahame-Smith to write it. Later that day, I Googled it and found out! Being a writer, I began to fantasize about what kind of mash-up novel I might write if I was to dabble in that genre. Later that evening, I was researching Emily Dickinson and not soon after that I had sketched out a plot line to mash her together with Frankenstein. Werewolves, zombies, and vampires had been an obvious norm for horror mash-ups. But no one had touched Frankenstein. Due to Emily’s real life obsession with death and immortality, it seemed like an obvious choice. After reading Mary Shelley’s Frankenstein for the first time, and doing lots of research on Emily, I was soon pounding out a first draft at about 10,000 words a week. I finished that first draft in just eight weeks! Yep! Eight weeks! The book was just meant to be, and the storyline came pouring out of me with ease. I stepped away from it during the holidays and turned it over to a professional editor. I also gave it to two close friends to read, who both had positive feedback about it. Before it came back from the editor, I was already composing query letters and seeking representation. The infamous blanket rejection letters came quickly back. By the time the editor returned the manuscript to me in late December, I was approaching small presses who all seemed very interested, given the successful track record I had with my three previous self-published books. But I started to consider self-publishing the book myself. I’d done it before and knew I could do it again though I really didn’t want to. Playing the role of marketer, author, editor, formater and publicist are tough, and I’d just taken a promotion at my 9 to 5. I knew my time to devote to the book on a daily basis would be limited and exhausting. I wanted someone in my corner to help me through the process and to wear some of the hats for me. RHP was recently born out of a local bookstore where I had done two signings previously for my third book. I also attend a monthly writer’s group there. They just released their first book in January, and it seemed like the perfect fit for me. I trust them, and have personally witnessed the strong marketing platform they’ve built for themselves since the store first opened in October 2010. After approaching Robin Tidwell, bookstore owner and publisher, with the idea, I let her read the manuscript and she soon offered me a contract. And so, Dickinstein will be published in October of this year! I’ll be sharing more about Emily and the book between now and then. For now, I’m so excited about this opportunity and I’m glad that “Miss Emily” finally has a home. 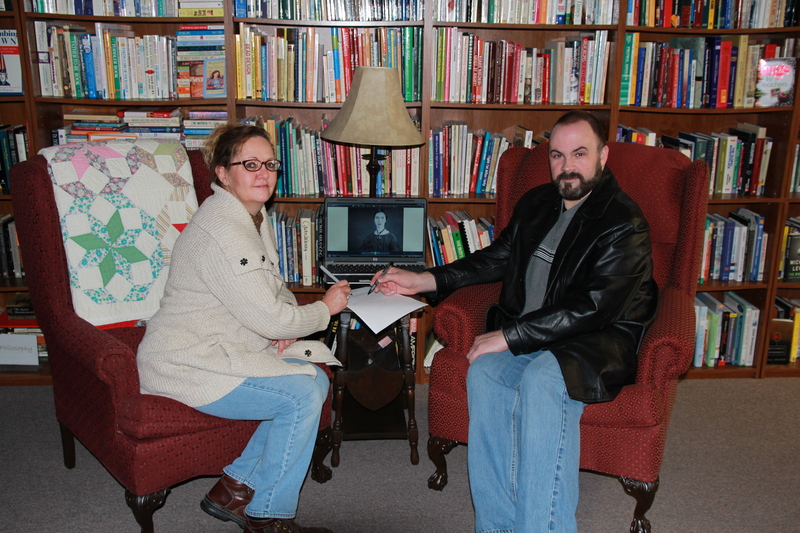 Signing my contract with Robin Tidwell, owner of RHP, as Miss Emily bears witness.